There's a reason it's called "radiant touch." Sweep it like a paintbrush along the T-zone (on top of or under foundation), and this mica-illuminated liquid brightens tired eyes and camouflages red splotches. Although it can be used as a concealer, the light coverage will do little to mask blemishes and lines. But prepare yourself for some sticker shock. If you're new to highlighters, start with Lancome's Flash Retouche -- it's about $15 cheaper. I'm completely and totally in love. With my husband, to be sure. 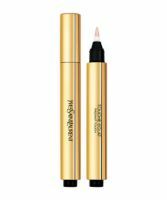 But also with Yves St. Laurent's "TOUCHE ÉCLAT Radiant Touch." It was formulated to bring light and radiance to the skin and brighten the complexion. It is pricey, to be sure, but it is one of the things I will continue to splurge on--it works that well! This most silky product is available in a wide variety of shades. I like ...read more"Luminous Radiance" (a light shade for fair skins with pink undertones). If I'm having a problem with dark circles, I'll apply another concealer under eyes first and then this on top. The pink base makes me look more awake and refreshed. If circles are no problem, a swipe of this just enhances my complexion and leaves me appearing well-rested. I dab a bit between my eyebrows and touch it to the circles at the very top of my nose, next to my eyes. It's like adding light! Some women use it to contour the area around their lips to make them appear like they have a fuller pout. I like the gentle brush which is at the top of the tube, but never touch it to anything but newly-cleansed skin. You don't want to pick up germs and contaminate the product--especially at $40.00. This is the BEST concealer I have ever used. Unfortunately it is very expensive - $43.00 the last time I bought it at a duty free store while traveling. I just can't justify paying that price. I have #3 and it marks on very easily. this works very well. Don't expect it to conceal because that's not what this is for. Soooo expensive though!